at ABCM, a church ministry here in Baguio with several daughter ministries throughout Northern Luzon. We are thankful to our friends at ABCM for inviting us. We had a great time. This website will be used primarily for new, and updates related to Bukal Life Care, while articles related to Pastoral Theology (and its related concerns) will be located there. You are welcome to visit any time. Chaplain Renato Eustaquio and his wife Dr. Joy are establishing a care center at Dr. Yanga’s Hospital in Bocaue Bulacan. Chaplain Renato is a staff member of Bukal Life Care. His work as an industrial/corporate chaplain is part of a pilot program of Bukal. However, based on a 3-day visioning here in Baguio last week, it was agreed that the correct direction is for the Eustaquio’s to set up their own center in Bocaue. This is an exciting opportunity and we wish them well. That is not to say that we are breaking all ties. Celia will serve as the supervisor for Supervisor-in-Training Renato in CPE. Additionally, he is on the board of trustees of Bukal. We look forward to working together for years to come. We had a great time at Center of Hope for Women… a ministry in Baguio City… in leading a one-day seminar on the basics of Christian Counseling. Around 15 trainees attended from the Center of Hope and Philippine College of Ministry. We also had a few of our CPE trainees join. We had five parts to our training. The first part was a presentation on the background or introduction to Christian Counseling. The next was a presentation on Emotions. The Center of Hope provided a great lunch. After lunch we had a learning activity that involved a ball of string and a series of insults and compliments (don’t ask… but it went well). Then we had our third presentaiton, and that was on self-care and healthy boundaries. Finally, we had question and answer. We also provided a handout on effective (and ineffective) therapeutic conversation. We really did not go over that because of lack of time. We started CPE this week for our Summer Intensive with 7 trainees. We had some changes in our follow-on units due to schedules of some trainees. This list updates these changes. In our partnership with Philippine Baptist Theological Seminary (PBTS), we are happy to have the first graduates of the new Pastoral Care programs at PBTS. They are the first in decades. We are justifiably pleased and proud. Periodically, we are asked if we can do formal psychological testing and evaluation. For years we have had to say that the answer is NO. We are a center for pastoral counseling, and psychological services. We can do some tests that are more for self-evaluation and growth, but not for formal psychological evaluation. However, Ms. Serafina Tenenan, RPsy, RGC, has now made herself available to us for formal psychological testing and evaluation. She is available by appointment. Contact us if you have any questions. Consider for the moment Maslow’s Hierarchy of Needs. As the theory goes, one cannot go to the next level of need until the lower ones are satisfied. This is not so much a proven truth, but a useful way of looking at things. 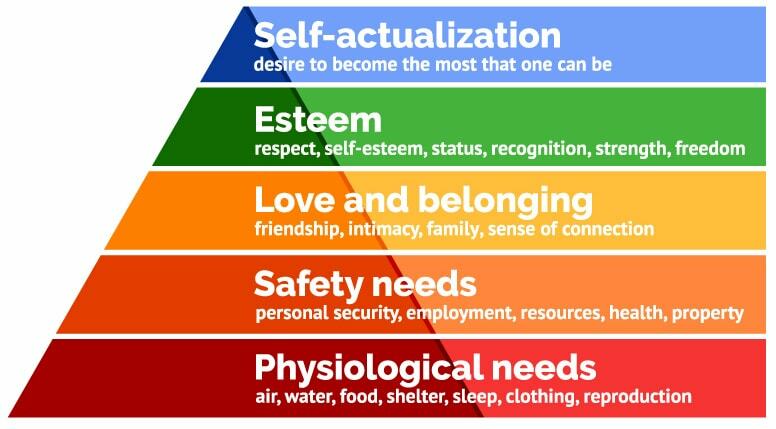 However, typically, this hierarchy of needs is also used by many as a guide for healthy thought and living. Consider a different way of showing this pyramid. In this case, moving “up” the pyramid is moving to the right on the graph. The blue line shows whether the focus is on a person as a social being or as an individuated being. For PHYSIOLOGICAL NEEDS, one is focusing on what keeps body and soul together… so clearly the focus is on the individual (food, water, shelter, air, etc.). As one moves towards SAFETY AND SECURITY, one is now moving towards the more emotional and social aspects of a person. Few if any really feel safe or secure alone or socially disconnected. As such, there is a greater recognition of the person as a social being. As one moves to the next level, LOVE AND BELONGINGNESS, there is the greatest recognition of a person as a social being. We were meant to be part of WE, not an aggregate of I’s. We are meant to be with others and part of others. As one moves to the next higher level, SELF-ESTEEM, the social aspect of a person is focused on less. Abraham Maslow saw self-esteem as having an internal component and an external component. The external component is status and respect given to a person from one’s social web of connections. The internal component is the feeling of self-worth one gets through internal personal evaluation and validation. The top level is SELF-ACTUALIZATION. This is “the full realization of one’s creative, intellectual, or social potential.” While Maslow did point out some famous people he considered to be self-actualized, he noted that fame had nothing to do with their status… it was about reaching their own individual potential, regardless of outside identification. As such, we have swung back fully to the individuated self and away from the social being. Consider a story from the TV Show “House” (Season 3, Episode 13). In this episode, Dr. Foreman was working to diagnose and treat a 16 year old male of Romani (“gypsy”) heritage. He is found to be quite knowledgeable and intelligent and is seen by Dr. Foreman as having great potential in medicine if he would get further education and move into medical work. However, the young man has no interest in that. He is tightly connected to his family and Romani clan. As such, they have a strong influence on what he does. He doesn’t want to go against them or separate from them. The story ends somewhat unresolved. Dr. Foreman is saddened that the teenager rejects the possibility of living up to his potential in terms of a medical career. He also, however, seems a bit saddened to realize that in his quest to advance his career, he has given up a lot… in fact leaving behind family, and lacking, in many ways any deep relationships. Who has chosen the better path? Both are okay in terms of physiological needs and safety and security (at least after the Romani teen was healed of his illness). Both also seem to have decent self-esteem. Dr. Foreman is recognized as a very competent physician. If he lacks self-esteem, he hides it well enough. The Romani teen also seems to have good self-esteem. He appears to be very affirmed by a loving family, and seems to like the trajectory his life is on. There are, however, differences. Dr. Foreman has a social deficient life… living alone, invested in his job over all other aspects of his life, and rather disconnected from his family. Still, he might be seen by Maslow as self-actualized since he appears to be living out his calling and potential as a physician. For the Romani teen, he seems to be well positioned in a loving and supportive family so he has no problems in terms of love and belongingness. However, he would never be seen as self-actualized since his potential in terms of medical science will never be achieved if he stays on the path he is on. Now consider this story as a parable in terms of East versus West of what is ideal. Dr. Foreman expresses the ideal of Western culture. He is highly individuated (as the term is used by Murray Bowen) from his birth family. He has found what is he is good at and gained expertise in it, and has achieved external fame, and appears to be living up to his potential. He is living the ideal of Western culture. The teenager is of Romani heritage, which has many aspects of Eastern culture. In it, family and community have greater import. He is far less individuated. However, it is within that supportive structure that he finds his place and his meaning. As such he has great self-esteem that comes from affirmation of loved ones, and the opportunity to live out his potential as a social being, even if not as an individuated being. With this figure, the bottom three steps stay the same. We all need these. However, when we get to Esteem there there can be a bit of a cultural split. With an Eastern focus, one may gain esteem more guided by affirmation from one’s social web— particularly family. The Western focus is less on external affirmation but on internal. Of course, these are not separated because in all people, esteem has an external and an internal component. It is just that the Eastern worldviews emphasize the external and the Western emphasizes the internal (at least in theory). From there things separate. In the Eastern worldview social actualization can be achieved in terms of finding one’s place in the world. One knows where one belongs in connection to others. In the Western worldview self actualization can be achieved in terms of finding one’s potential and achieving it. Which one is better? I can’t say, but I doubt you can either. Each has its value but also its problems. On one side a person may feel trapped while on the other one may feel desperately lonely. The lack of perfection should hardly be surprising in an imperfect world. For this reason, there has been work in recent years on contextualized psychology. Bowen’s concept of individuation in family systems, and Maslow’s concept of self-actualization may be cultural ideals rather than universal ideals. However, I think it is worth noting that the church may fit better into the Eastern worldview in terms of social self-actualization. While a lot has been written about how Christians can achieve their God-given dreams, actualizing their calling and gifting, much of the Biblical understanding of the church is in terms of social actualization. It is not about you or me or about your dreams or my dreams, but our place as members of one body, carrying out our social roles within a community structured more on love and belongingness than on merit and success. This does not discount the other side, but I would suggest that far too many churches are filled with far too many disconnected and lonely people (“… where do they all come from.”). Perhaps it is time to consider a different model for church life and individual growth.